Overview: As Boston's largest neighborhood, the South End is a very popular, culturally diverse neighborhood. This area is home to some of the city's best restaurants and bars, as well several great art and music venues. Location: The South End is generally considered the area between Massachusetts Ave and Berkeley/E. Berkeley St. Neighborhoods bordering the South End include Roxbury, South Boston, Columbus and Chinatown. Ruggles and Massachusetts Ave stations are popular MBTA stops in the area. Culture: The South End has an ethnically diverse culture consisting of college students and business professionals, as well as families. There are several small parks throughout this neighborhood and dozens of great restaurants, especially along Tremont St. Notable Places: Tremont St., Boston University School of Medicine, Blackstone Square, Franklin Square, Northeastern University. 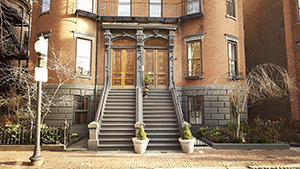 Browse South End Boston luxury real estate listings below. If you see a listing you like, be sure to register so that you may save the property and receive updates from us if a new property enters the market that you may also enjoy. You can also search by using our advanced search tool to browse all Boston luxury real estate listings. *JULY* Exclusive studio w. alcove apartment available in tranquil setting on Claremont Park in the South End - near Mass Ave. T Station and number 1 bus to Cambridge, this fourth floor FULLY FURNISHED studio comes fully equipped - just show up with your suitcase, and move right in. Hardwood floors, blue marble fireplace, high ceilings, central air/AC, and immaculate attention to historic details throughout both the unit and building. Bi-weekly cleaning included in the rent of the room/towels/linens and sheets. Step out your front door, and be within walking distance of many stores, restaurants, parks, schools, and labs. Unique opportunity to rent a charming studio in a great location! I have a question about the property at 4 Claremont Park Boston MA 02118 (#72482855). I would like to schedule a visit for the property at 4 Claremont Park Boston MA 02118 (#72482855). Two car tandem space at 700 Harrison Avenue available immediately for rent. $400/month for the tandem two car space or landlord would consider renting as a a single space for $275/month. If the space is rented as a single a second car is not permitted. Can rent month to month. I have a question about the property at 700 Harrison Boston MA 02118 (#72466696). I would like to schedule a visit for the property at 700 Harrison Boston MA 02118 (#72466696). Elegant six-story 38,000 SF building. Situated on the corner of Massachusetts Avenue and Columbus Avenue. Retail space occupied by Dunkin Donuts and one of South End's hottest new restaurants, SRV. Recent common area capital improvements. Abundant local amenities. Steps from MBTA Orange and Green Lines. Strong local ownership. I have a question about the property at 434 Massachusetts Avenue Boston MA 02118 (#72304679). I would like to schedule a visit for the property at 434 Massachusetts Avenue Boston MA 02118 (#72304679).